homework and thoroughly researched the issue. I do not certify, franchise or endow people with the title of Representative of my "system" -- especially in other countries. If you encounter someone who is claiming these things...grab your wallet and run. He's lying and he wants your money. I have very strong opinions about the cults that are rampant in the martial arts world. Unfortunately most of these money sucking programs use certifications, franchising and bestowing area representation as their facade of legitimacy. Like unaccredited Internet Universities and the Universal Life Church, these organizations have no creditability outside themselves. This means that the certifications they hand out really aren't worth the paper they are written on. My creditability is based on the accuracy and usefulness of the information I share. It is based on teaching information that works. Not on the fact that I am the grandmaster of a deadly, secret streetfighting system that I will bestow credentials in. You can cross check my information with professional fields outside the martial arts/self- defense world. In fact, I heartily encourage you to do so because that is where I got most of it, from accredited and legitimate fields such as law, psychology, criminology, sociology and anthropology. What I have a gift for is translating how those fields apply to self-defense. While we appreciate the number of requests for reciprocal links that we receive daily, the truth is, if we don't know you, then odds we won't link back to you -- especially if you are selling stuff over the internet. The primary purpose of this Website is to distribute quality information about personal safety. Our choices of links are to established, reliable organizations and individuals. Sources whom we have confidence in their goods and services -- usually through previous dealings. As our our number one requirement is reliable information, we do not link to companies, schools or equipment dealers we do not know and cannot guarantee -- either their services, the caliber of information or their behavior. While linking to us will help your search engine placement, do not contact us and request a reciprocal link. Until we know who you are and that you are on the up and up, it ain't gonna happen. The good news is that I am not looking for royalties. You are in fact allowed to use the information you find here - conditionally. What I am seeking, however, is if you find useful information here that you give credit where credit is due. In as much as I cite my sources, I ask you do the same. 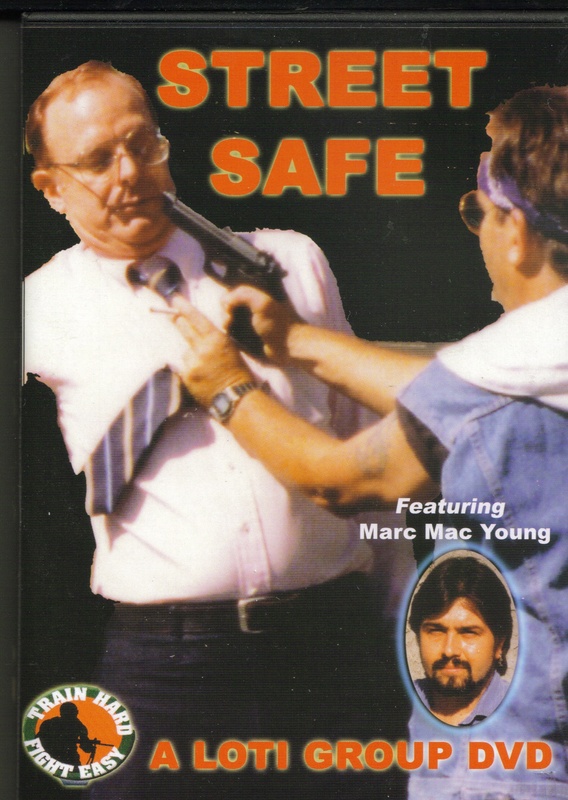 I hold the registered copyright for the "Five Stages of Violent Crime" arising out of the 1993 video Safe in the Street, the book Safe in the City also found at the bottom of thispage. Countless other terms, explanations and sayings arise out of my books and videos. But those are too numerous to go into right now. Use of and reprinting for commercial distribution of this information without expressed, written permission by the author is prohibited. However, having said that. I do give you permission to use the systems herein for verbally communicating information regarding personal safety on the condition that you cite your sources. The author retains all rights. Commercial reproduction of this information by means written, video or other electronic media is prohibited without express written permission from the author. In short, although you can't publish it without written permission, you can use it in workshops and your school - AS LONG AS YOU GIVE CREDIT. If you want to post it on your Web site, publish it in your magazine/manual or hand it out in your school/during seminars -- contact me. I don't bite. I tend to freely give permission to use my information, as translations around the world prove. And I don't ask for royalties when I do that. The bottom line is this, "Ask and ye shall receive." Don't ask and what ye shall receive will be a copyright infringement case. And I guarantee you that my lawyer can beat up your lawyer, no matter what country you are in. As a further stipulation I would ask that if you are going to use the five stages system, then teach it in toto. Do NOT edit parts that you do not understand. Do not try to change the system to fit your ideologies or understanding. Many years of work and research went into the program to make it a complete as possible. This not only includes extensive field testing, but peer review and review from outside sources (academic, police, military, legal and psychological) In short, we not only tested it out in the streets, but experts from multiple fields reviewed the information and tried to find holes and flaws. When flaws were found, they were corrected. The core, however, withstood this rigorous review. As did the refined version which is presented here and in my released works. It is acceptable to me if you present the whole system and say "But I disagree with this point because of A, B and C." Inasmuch as the full information is still being transmitted, this allows the students to make an informed and rational decision about their personal safety.